It seems that Vodafone, India’s second largest GSM service provider is not interested in joining the 3G launch war which is all set to take off next month starting with TATA DOCOMO and probably Airtel too. 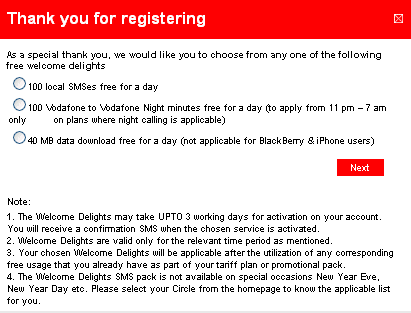 Vodafone in a latest move has now chosen to delight its prepaid as well as post paid customers.In a bid to provide benefit of diwali shopping to its customers, vodafone is providing best deals to its customers, no not the “best deals” for the recharge this time but best deals on shopping. Yes, you have heard it right, Vodafone will provide you with the best deals and that too on a high end products like Giordano watch worth a whopping Rs. 5250 for mere Rs. 899 to name one, but there are many other offers ranging from Life style to travel to books and magazine. So what are you waiting for, just visit store, i mean just visit this deals store at www.vodafone.in. Yes, i know you will be eager to know more about it but adding to the delight, on successful registration you will also be welcomed with telecom goodies like 100 local smses for a day, 100 local vodafone night minutes or also you can choose from 40 MB of free data all for a day.